Implementation of a 21st century to-do list app. 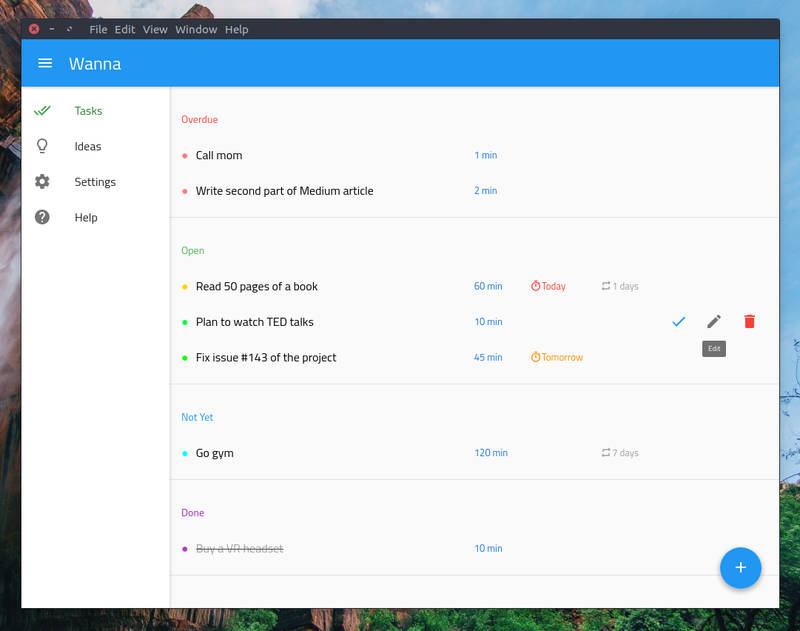 Wanna is an implementation of a 21st-century to-do list app. It introduces a new workflow and has its own philosophy which makes it different from other to-do list apps. Wanna is under active development. You can see a list of its releases here. At this time, the latest release of the app is Flex Alpha 2 release for Mac, Windows and Linux (.deb only). In addition, you can easily download the repo&apos;s source code and build a version suitable for your own platform with just a bit of effort. In the near future, other platforms will be officially supported. Tutorials will be added soon. Please see contributing guidelines for a comprehensive description of how to contribute to Wanna. Please see contribution types that we are looking for in Wanna, including feature requests and bug reports. If you want to see a unofficial list of features which will be added in the next versions of Wanna, take a look at our road map. Material-UI: React Components that Implement Google&apos;s Material Design. Create-react-app: Create React apps with no build configuration. React-Router: Declarative routing for React. Now UI kit: Now UI Kit Bootstrap 4 - Designed by Invision. Coded by Creative Tim. BrowserStack: Live, web-based browser testing. dns.js.org: Providing nice and free domains for GitHub Pages since 2015. Every time one builds a to-do list app, a puppy dies. So why should Wanna exist? There are many to-do list apps out there. All have pros and cons and may or may not work for you. But nearly all of them lack one critical feature: they are just a digital version of paper to-do lists. You throw some tasks into them, and then, whether you complete the task or not, nothing great happens: The app is somehow passive. An idea occurs to you. It can be any type of idea; listening to a great music, doing your school homework, plan for running, reading a book, learning a new programming language, trying always to smile, launching a small party with your family and friends or watching a TED talk are some examples. You add the idea to your ideas list. You don&apos;t need to care about when to do it. It&apos;s just an idea, not a task. Now you have a mess of ideas. You can scroll up and down and pick one of them out of your list. Having your tasks added to your list, Wanna shows each task with a colorful status circle. The more this color tends to become red, the closer the task due date is. Don&apos;t let those circles turn red!